You guys... how CUTE are these cuddly & cozy bear pajamas?! They came in the mail last week and I literally ran around the house in excitement. Justin actually laughed at me because I was so giddy. Besides being insanely cozy, they are SO warm. Even though the bottoms are shorts you will stay incredibly toasty. I was having a hot flash taking these photos because it was already warm in the house, and I joked that I've been needing these for quite some time - I'm always cold. I got a ton of questions about my lip color last weekend when I wore it on Instastory so I've linked it here above and below. It's actually a crayon type lip product so it's super easy to apply and I didn't even have to use a lip liner. It's the perfect color for the holidays too! I didn't buy my bear slippers to match my bear pj's but it worked out well. They are super comfortable and soft and come in three different colors. I try and find a pair like this every year because I usually wear them out in the first couple months (I'm rough on slippers lol). My pajamas also come in some other animals like a pink cat and a panda that I've linked for you as well. I'm not sure if they have bows on their ears as well since it was a total surprise when mine came - I had no idea and it's my favorite part! 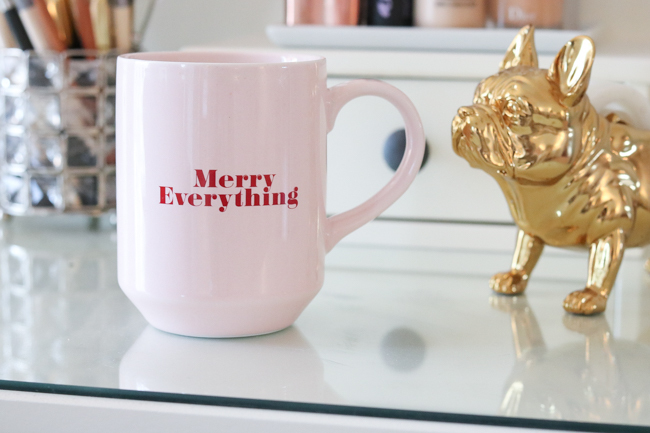 Make sure to check the right sidebar for some of my other cozy favs and don't forget you can view my HOLIDAY SHOP at the top of the blog for tons of amazing gift ideas for everyone at every price point.